Adobe eSign has worked for every contract our company has issued for the past 3 years. From simple one signature consulting agreements, to multiple page, multiple signer partnership agreements and MNDAs, we find the program meets all of our needs. Clients receiving our contracts rarely ever have any trouble viewing, downloading and signing the document. We have not found an instance for which eSign has not worked. 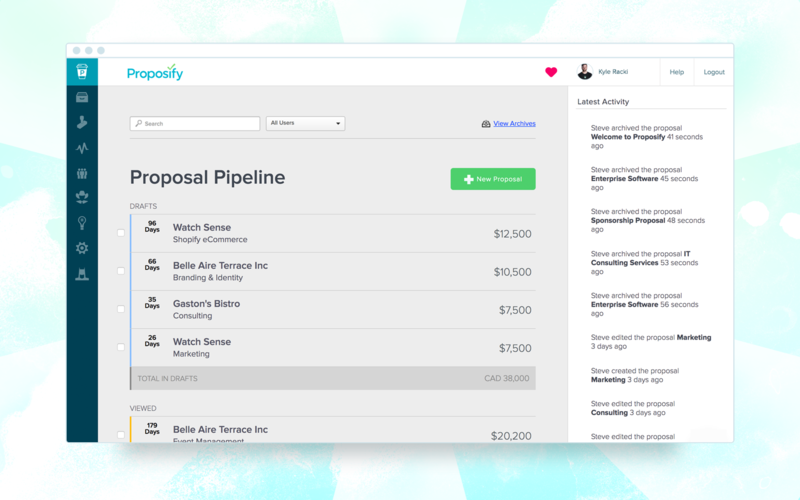 If you send out 3+ proposals, agreements, etc a month, you need Proposify. If you have multiple people on your team sending out those agreements, then you needed it yesterday. Incredibly easy to upload routine documents stored in account library or upload a brand new, customized document. Website provides clear instructions for reader use. Also very easy to guide new users through signing documents. EchoSign provides a signature audit summary that allows the tracking of signature progression. A very useful tool in proving signature email address, IP address and date/time stamp. Website also provides opportunity to send reminders to document recipients to sign if they have not done so by a specific timeline. Provides return receipt to the signer of the document once completed. Managing our deals that are outstanding. Making it easy for our clients to sign a proposal, and get a copy without taking a million extra steps. Syncing with our accounting system and CRM and updating records based on client activity with our proposals. I would like to see some development to the building of forms, we recently found it quite difficult designing a form using the Echosign coding in word because the size of the field is reliant on the number of characters in the field name. Perhaps this could be altered so we could just type in the number to represent the size of the field. I would like to be able to validate a form as it is being completed, depending on responses provided by a client. Essentially an interactive form. The agreement quite commonly finds it's way into a clients junk email. The editor, and the content library could be more streamlined. The fee tables could be easier to use. It would be nice to be able to have more functionality for proposals that aren't based on fees. (This is already in the works, and there is SOME functionality, but it would be nice to be able to update different Pipelines in HubSpot based on different streams for example). Renewing our license is a no brainer, the system pays for itself when compared to postal costs. No to mention the fact it is a more effective and efficient way for us to get clients on board. We have integrated Echosign with our case management system because it has played such a key part in driving our business forward. It's become a huge part of our sales process. It has a lot of great features but some things are not clear on how to set up and printing signed forms once completed is time consuming. Make sure you set aside enough time to get properly trained on the system. We needed to act quickly on our initial use of this product and I did not have the time to go through all the proper training so it was basically go in and learn. I think it would have been much easier had I been given the time by the company to learn everything first. We used them for policy acknowledgments in the past. We would have to wait 2-3 days for the form to be created and then would be charged $500 for the creation of the form. Adobe eSign takes much less time and there is no charge for adding new forms. Proposify allows me to save templates and template sections, which for me is the biggest difference. Although Adobe pdf is nice it lacked in many features that I didn't even realize were out there and that now save me so much time. Another thing I love with Proposify compared to Adobe is that I can move sections around much easier on the screen and not worry about things getting misaligned which would happen to me a lot on Adobe. Finally, the ability to e-sign was the biggest reason I chose to switch over. Higher quality orders are being submitted. Previously, we had a lot of problems with missing pages on contracts and clients writing on contracts, both of which could cause orders to be rejected. In general document integrity is really important. It helps assure to a sales rep that their order will be accepted. No lost revenue. It reduces the risk of a contract being rejected in a quarter. Previously, we had a 1-2% contract rejection rate and now it’s practically zero. There is a staff time benefit of not having to check documents that come through Echosign. You don’t have to count pages etc. For my staff, it probably saved her 10% of the time. Proposify has had a positive impact on our ROI. It makes us look extremely professional and trustworthy which leads to leads converting faster. Try Proposify full-featured FREE for 14 days. No credit card required. No contracts. Cancel anytime. Get 2 Free Months with an Annual Tall, Grande, or Venti Subscription.